There are dozens of lakes in Lassen Volcanic National Park, most far from any road in the volcanic plateauland on the east side of highway 89, but some of the most scenic are found in the higher elevation areas around Mount Lassen. 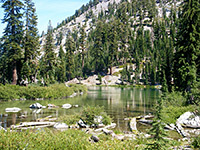 Most visitors see at least Lake Helen and Elizabeth Lake since they sit right next to the road, either side of the most used trailhead in the park, for Bumpass Hell; the next easiest to reach are Terrace, Shadow and Cliff - three very pretty pools set in glacial cirques in the lightly wooded, mountainous country between Lassen Peak and Reading Peak. Cliff Lake is the best owing to its colorful, photogenic surroundings, and also furthest from the road, though at only 1.8 miles the hike is still quite easy, and all three can be seen in a couple of hours. Past Cliff Lake, a longer and less-used path leads downhill to the North Summit Lake campground so the hike could begin from here, in which case the round trip distance is 7 miles. Cliff Lake topographic map, Lassen Volcanic National Park map. 11 views along the trail to Cliff Lake. 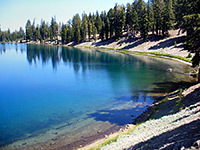 The trailhead for the shorter version of the hike is along CA 89 at 8,050 feet, 1.7 miles east of the road's summit near Mount Lassen; the high elevation and predominantly sheltered, north-facing terrain mean that snow usually persists on the trail well into July, and the lakes are only pleasant for swimming for a month or two at the end of summer. Vehicles may be parked at a pull-out on the north side of the road, from where the trail descends gradually across sandy, bouldery land dotted with bushes and large hemlock trees. After crossing a hillside and passing a junction with a trail from Hat Lake/Paradise Meadows, the first lake (Terrace) soon comes into view, tucked away in a shady ravine. The path zig-zags down quite steeply to the edge of the lake, which is small but scenic, bordered by a rocky cliff face on one side and a wooded slope on the other, with grassy or pebbly beaches running part of the way around the shore. The trail then follows the south edge, passes over a low saddle to reveal a nice view of Shadow Lake just beyond; this is circular, deeper and rather bigger, filled with bright blue-green water and surrounded on three sides by steep, rocky hills sparsely covered by fir and pine. The route descends to the lakeside and leads along the eastern shore, past a few narrow sandy beaches. A number of ancient fallen tree trunks radiate out from the edge, forming natural piers over the water. The next part of the path continues to descend gradually through less wooded ground and soon the trees are replaced by grassland, floral meadows and a few seasonal ponds, as the prominent white rock slopes of 8,701 foot Reading Peak rise up to the south. The trail re-enters the forest and arrives at a junction; straight on is the 2.4 mile route to Dersch Meadows and the Summit Lake campsites while right is a short path to Cliff Lake, through a patch of small, closely-growing trees and out on to the grassy banks of the lake. Cliff is definitely the most scenic of the three lakes as on one side the waters lap against a steep, white, boulder-strewn granite slope, streaked with darker colored bands, making a stark contrast with the verdant green vegetation and the clear, aquamarine water. The lake also has a picturesque, tree-laden island and a fast-flowing inlet stream, originating from a spring a short distance uphill. 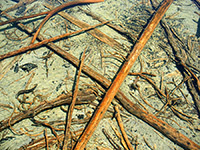 Many thin pine trunks have fallen into the upper end of the lake and become partly submerged, creating an unusual reddish lattice, home (in summer) to thousands of tadpoles. Sandy beaches line the lakeshore and there are plenty of places to relax, have a picnic and look for wildlife - creatures that may be seen include deer, chipmunks and squirrels.